Our experienced team has the ability to lead every line that we write, providing valuable insight and setting rates and conditions. We’ll always tell you what we really think – especially when it comes to explaining tough decisions. We take a very consistent approach to lines and markets and work hard to develop long-term partnerships with clients and brokers. With offices in London, Dublin, Brussels, Bermuda and New York – and the ability to offer Lloyd’s or company security – we offer real choice in terms of how you do business with us. 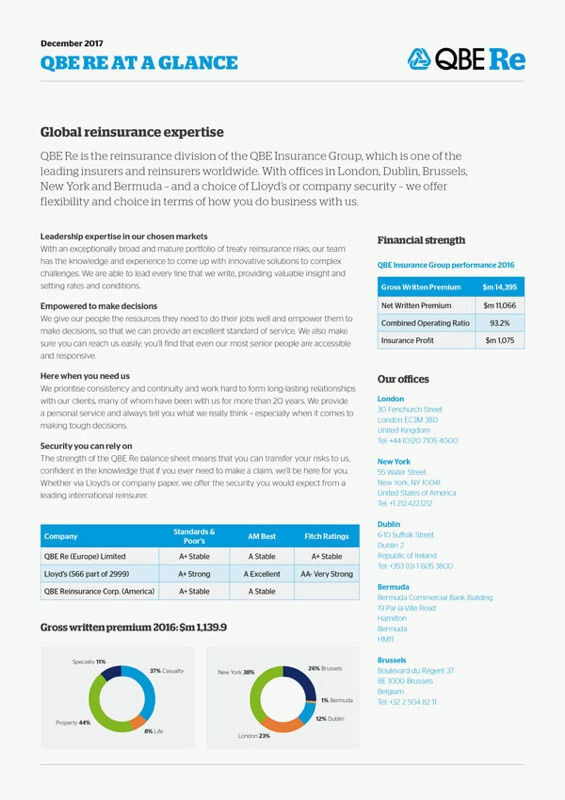 QBE Re is part of the QBE Insurance Group, which is one of the world's leading insurers and reinsurers, providing cover in more than 140 countries. Committed to building strong client relationships, we focus on providing outstanding service and offering direct access to underwriters who are empowered to make decisions. With an exceptionally broad and mature portfolio of treaty reinsurance risks, our team has the knowledge and experience to come up with innovative solutions to complex challenges. You will find that even our most senior people are accessible and responsive. We provide a personal service and work hard to build durable partnerships based on openness, integrity and trust. Our approach is very consistent, so you can depend on us to be here when you need us. We commit to lines and markets for the long term, rather than dipping in and out as market conditions fluctuate.